One of the things I would like to work on in 2017 is my photography. I am joining in with Nana Cathy and Wild Daffodil’s weekly photo challenge. This week’s one word prompt is Favourite. An easy one for me this week and my first time posting more than one image for this weekly photo challenge. As I have talked about before, we moved to this house with the most amazing garden in October 2016 and I have been head over heels in love with our outdoor space since. On moving in week I took this photo. The majestic horse chestnut tree, the autumn colours, the variety of trees in the border *happy sigh*. This is absolutely my favourite view. I decided to take weekly photos of this corner of the garden and at the end of the year stitch them all together to show the changing seasons. I have photos in all weathers and light conditions, photos where I can barely make out the tree through the dense fog, and as I hoped, the seasons changing. I’m not going to share them all here! Just my favourites from each season. With a hard frost. We didn’t get any snow this winter and so this was the most wintery I managed. This photograph was taken just after Christmas and added to the landscape is a metal peacock sculpture my lovely husband bought for me as a gift. Early spring means daffodils! This was so exciting for me to watch the daffs come up and then bloom. Teeny little buds on the chestnut tree. Late spring and the daffodils are finished but the tree is suddenly covered in leaves and blossom candles. Finally a photograph taken this weekend, early summer. All of the trees are in full leaf and the rhododendrons are in full bloom. So much lovely happiness in my favourite photographs. This week’s one word prompt is Cycle. In the summer of 2014, Le Tour de France came to Yorkshire. It was a big deal with much excitement generated for the event. From my family’s perspective the highlight was the lengths people went to to decorate their towns, villages and roads. Yellow bicycles popped up everywhere along with spotted jerseys and more bunting than I have ever seen before. The enthusiasm for cycling in Yorkshire led to the creation of Le Tour de Yorkshire in 2015 and the 3 day race has continued into 2016 and a just a few weeks ago for this year’s fixture. Four years of cycle races later and the county is peppered with Le Tour decorations with posters and bicycles that have been left in situ long after the cyclists have moved on. Last year Le Tour came through our village, although we hadn’t yet moved here, and this yellow bike has been at the edge of this field, by the roadside ever since. I love the way the countryside is claiming it for its own and suspect that unless it is moved by next summer it will have been fully consumed by greenery. This week’s one word prompt is Arch. Why settle for one arch when you could have lots! These beautiful arches belong to the ruins of St Mary’s Abbey in the heart of York. The Abbey is a favourite haunt of ours and we have spent many a happy summer hour picnicking in the shade cast by this large section of wall while the children clamber up the columns spread throughout the Museum Gardens. Coincidentally I’ve just finished reading Behind The Scenes At The Museum by Kate Atkinson, a fabulous novel telling the life story of a character named Ruby Lennox and primarily set in York. It was lovely to read a book when you intimately know the setting and I was interested to learn that this park used to cost sixpence to enter and had peacocks roaming around, it is easy to imagine those majestic birds in this setting. One of the things I would like to work on in 2017 is my photography. I am joining in for my fifth week with Nana Cathy and Wild Daffodil‘s weekly photo challenge. This week’s one word prompt is Traffic. I have taken each of my other weekly photos so far without leaving the village but there is not much in the way of traffic around here and so I took a short trip into Tadcaster. This solitary car and pair of pedestrians may not look like a lot of traffic but it is very exciting traffic. Due to damage caused by flooding and high river levels in December 2015 the bridge in the foreground, across the River Wharfe, collapsed and has been closed for the last year. The bridge reconstruction work is now complete and the bridge reopened to traffic just 2 weeks ago. So on Saturday I drove to Tadcaster, and across the bridge, and set out to photograph the traffic, all the while thinking how lovely it is to see people able to drive from one side to the other of a town which has been divided by a river for over a year. If you’ve ever visited here before then you’ll know I love wreaths very much! So when Lucy announced the Moorland Blanket CAL as tempted as I was by another blanket my mind immediately went to wreaths. I could easily visualise the colours which she had chosen wrapping around in a circle and representing the landscape of the moors. It seemed an obvious next step to put the most recognisable resident of the the North Yorkshire Moors nestling inside. So I made a Swaledale Sheep! I had made a sheep wearing a rainbow jumper for the charity fundraising flock at Yarndale and you can see her here and so I used that pattern as a basis for the body adding rows here and there and using aran weight yarn to make a sheep the right size. I made up carefully designed the head myself to add the white nose and get a bigger size and used knitted icords to make the distinctive horns. Oh and instead of a colourful jumper this sheep got long shaggy hair! Then it was a case of the wreath base. 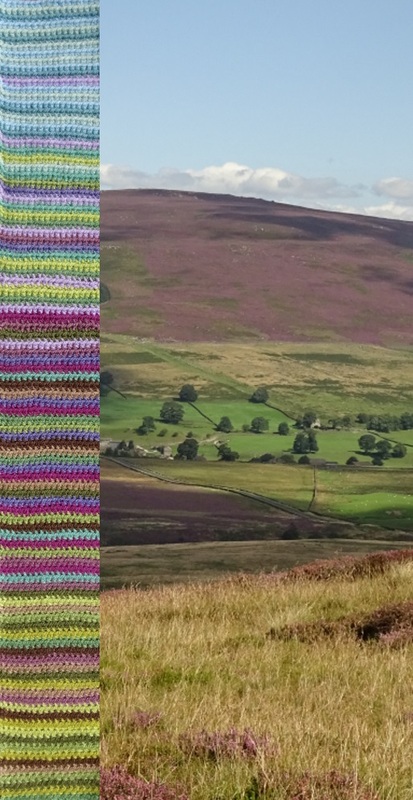 Lucy has a stunning photo on her blog here of Yorkshire moorland with narrow stripes of crochet in the colours she selected for her blanket in her perfect words “tell[ing] a visual story of the landscape that inspired them” and this was the strip of colour I saw wrapping around my polystyrene base. I started with all good intentions of waiting for her to reveal the colour order on her blog. Until I crocheted the first 20 stripes and then sat impatiently considering waiting a week for the next colours! Everyone else is making blankets and that obviously takes a lot longer than an 18cm wide piece of single crochet! I studied the photo and took my best guess at the colours and went it alone. Often when I make a wreath base cover I am so keen to get it stretched out in place and see how it looks that I forgot to take a photo but I remembered to snap a quick shot last night. By fire and lamp light so its not brilliant but it does give an idea of how I put these things together. Thats 73 stripes of single crochet (you can see where I realised it had got a bit narrow and increased the width a bit, wreath base covers are far from an exact science). 73 stripes is 146 rows and more distressingly 146 ends to deal with! But I valiantly tackled the ends and to ensure that the colours didn’t skew or twist and to help the back to be as lovely as the front I used the tail end to sew up the corresponding stripe as seen in this photo. Oh so very fiddly but absolutely worth it. Which leaves only one thing left to show you. The finished wreath. Ready? Ta-da! Turns out there was one last thing left to say, Lucy likes it!! I posted a photo on her Facebook page and she said that she loves it. So as you may know I’ve been a bit excited about visiting Yarndale! Today was the day and I took a lot of photos of all of the yarny goodness which I would love to share with you here. I had such a lovely day. On arrival I went straight to the Knit and Natter lounge to see if I could find my yarn heroes. And I did! I had a great chat with Winwick Mum, Christine about how easy to understand her sock pattern is and about the community of sock knitters she has created who have contributed to the sock line. Then I talked to Lucy from Attic24 and told her all about my Wreaths for Every Season and she gave me a huge cuddle and got excited spotting all of the little details on the photos I showed her of the wreaths together. Her favourite is the Winter wreath! Where to start? How about with the setting? Yarndale is held at an auction mart in the town of Skipton in the Yorkshire Dales. The Dales for me perfectly sum up the image of Englands green rolling hills. The venue is under those green roofs nestled in the hills. And because its usually used for the auctioning of livestock rather than the selling of yarny loveliness there are always some animals at the festival. Here are some I snapped. I think I’m getting ahead of myself here though showing you the inside while there is still the outside to talk about. The auction mart is a short walk, through a park, from the town’s train station. There are a pair of decorated buses that shuttle between the two all day. I arrived a bit early by design to check out the local pokemon situation and was thrilled to discover a gym at this lovely sheep tucked away in a hidden square, left over from when le Tour de France came through Yorkshire in 2014. Then I walked up through the park to the auction mart. These are just a few of the wonderful yarny decorations that line the route so that you can be sure you are on the right track. I think I might have let out a little squeal of delight on arriving as the outside looked amazing. There were giant mandalas made by Lucy from Attic24, pom poms made by local school children lined the path, there was a totally yarn covered van selling finger puppets and the Thirsk Yarnbombers had covered all of the posts. All that before you even get through the door! I was quite disappointed to find that on arrival on the second day of the festival my sheep and the rest of the flock were nowhere to be seen having all been sold on the first day! This is fabulous news for the wonderful Martin House who were receiving all of the funds raised by the sheep but it was a shame not to see them all together. The community projects from previous years were all there and looking great though. The bunting from 2013, mandalas from 2014 and flowers from last year. Details of all of these projects are on the Yarndale website. And I did find my socks amongst around 100 pairs on the sock line! Read more about them here. Can you see my pair? These were some of the exhibitors displays that caught my eye. Birds from Sue Stratford. I backed Sue’s kickstarter campaign to print a book with these patterns in and have my name in the book! I saw a copy today and am very excited about it arriving in the post this week. This is made from lace by the Craven Guild of Lacemakers. One of their members was kind enough to chat with me for a while about non-traditional lace making. Maybe one for me to try in the future. And a massive 8kg ball of yarn from Woolly Mahoosive and my reaction to it being considerably bigger than my head! To counteract the gurning a nicer photo of me wearing my shawl made from Cuddlebums yarn. I had a lovely chat with Jodi who recognised my shawl immediately and several other people who also made shawls in our make-along. Phew, what a day! I can’t wait to do it again next year! Do you remember my Yarndale Socks? Well the time has finally arrived and this weekend is the time for the lovely woolly festival! I’m so excited to be heading into the Yorkshire Dales for some serious shopping and inspiration gathering. Its weeks and weeks since I posted off my socks for Christine’s sock line and my sheep for Lucy’s flock so I will be looking out for them when I get there and following along once I get home to see where their onwards journeys take them. Last year at Yarndale I saw a scarf pattern I liked pretty soon after entering the auction mart and then did 3 circuits of the hall looking for the perfect yarn to make it with. I found Jodi at Cuddlebums and her rainbows were exactly what I was looking for. I bought my first (of very many!) skein of hand dyed yarn from her and made a Seafoam Scarf with it. When Jodi announced that she would be making a Rainbows in Yarndale box for fans of her yarn to makes shawls to wear to this year’s Yarndale I jumped to sign up for it. I made mine into a Color Affection which I will be proudly wearing to identify myself as a Cuddlebums lover. Oh and I made my sheep’s coat with this yarn too! And attached to my hand bag will be this teeny sock so that other members of the Sockalong will be able to spot me. So if you are also heading to Yarndale look out for me wearing my shawl and sporting my teeny sock somewhere about my person. I expect I’ll be carrying lots of bags and stroking yarn! If you can’t make it then check back here for photos after the weekend!